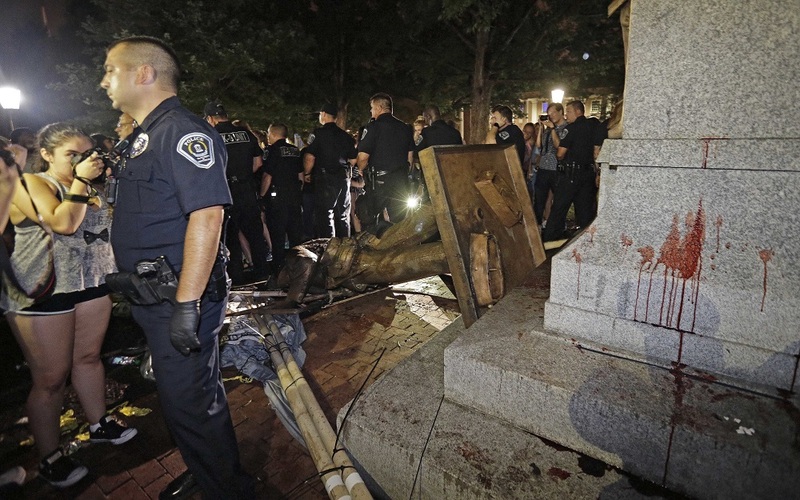 CHAPEL HILL, N.C. (AP) — A Confederate statue in the heart of North Carolina’s flagship university was toppled Monday night during a rally by hundreds of protesters who decried the memorial known as “Silent Sam” as a symbol of racist heritage. Gov. Roy Cooper had called for removing Silent Sam and other rebel symbols on public land. A state historic panel is set to meet this week to debate Cooper’s request to remove other Confederate monuments at the state Capitol. “Tonight’s actions were dangerous, and we are very fortunate that no one was injured. We are investigating the vandalism and assessing the full extent of the damage,” the university said in a tweet.